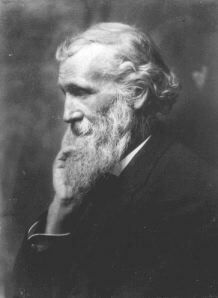 John Muir - farmer, inventor, sheepherder, naturalist, explorer, writer, and conservationist - was born on April 21, 1838 in Dunbar, Scotland. Until the age of eleven he attended the local schools of that small coastal town. In 1849, the Muir family emigrated to the United States, settling first at Fountain Lake and then moving to Hickory Hill Farm near Portage, Wisconsin. Muir's father was a harsh disciplinarian and worked his family from dawn to dusk. Whenever they were allowed a short period away from the plow and hoe, Muir and his younger brother would roam the fields and woods of the rich Wisconsin countryside. John became more and more the loving observer of the natural word. He also became an inventor, a carver of curious but practical mechanisms in wood. He made clocks that kept accurate time and created a wondrous device that tipped him out of bed before dawn. In 1860, Muir took his inventions to the state fair at Madison, where he won admiration and prizes. Also that year he entered the University of Wisconsin. He made fine grades, but after three years left Madison to travel the northern United States and Canada, odd-jobbing his way through the yet unspoiled land. In 1867, while working at a carriage parts shop in Indianapolis, Muir suffered a blinding eye injury that would change his life. When he regained his sight one month later, Muir resolved to turn his eyes to the fields and woods. There began his years of wanderlust. He walked a thousand miles from Indianapolis to the Gulf of Mexico. He sailed to Cuba , and later to Panama, where he crossed the Isthmus and sailed up the West Coast, landing in San Francisco in March, 1868. From that moment on, though he would travel around the world, California became his home. It was California's Sierra Nevada and Yosemite that truly claimed him. In 1868, he walked across the San Joaquin Valley through waist-high wildflowers and into the high country for the first time. Later he would write: "Then it seemed to me the Sierra should be called no the Nevada, or Snowy Range, but the Range of Light...the most divinely beautiful of all the mountain chains I have ever seen." He herded sheep through that first summer and made his home in Yosemite. By 1871 he had found living glaciers in the Sierra and had conceived his then-controversial theory of the glaciation of Yosemite Valley. He began to be known throughout the country. Famous men of the time - Joseph LeConte, Asa Gray and Ralph Waldo Emerson - made their way to the door of his pine cabin. Beginning in 1874, a series of articles by Muir entitled "Studies in the Sierra" launched his successful career as a writer. He left the mountains and lived for awhile in Oakland, California. From there he took many trips, including his first to Alaska in 1879, where he discovered Glacier Bay. In 1880, he married Louie Wanda Strentzel and moved to Martinez, California , where they raised their two daughters, Wanda and Helen. Settling down to some measure of domestic life, Muir went into partnership with his father-in-law and managed the family fruit ranch with great success. But ten years of active ranching did not quell Muir's wanderlust. His travels took him to Alaska many more times, to Australia, South America, Africa, Europe, China, Japan, and of course, again and again to his beloved Sierra Nevada. . In later years he turned more seriously to writing, publishing 300 articles and 10 major books that recounted his travels, expounded his naturalist philosophy, and beckoned everyone to "Climb the mountains and get their good tidings." Muir's love of the high country gave his writings a spiritual quality. His readers, whether they be presidents, congressmen, or plain folks, were inspired and often moved to action by the enthusiasm of Muir's own unbounded love of nature. Through a series of articles appearing in Century magazine, Muir drew attention to the devastation of mountain meadows and forests by sheep and cattle. With the help of Century 's associate editor, Robert Underwood Johnson, Muir worked to remedy this destruction. In 1890, due in large part to the efforts of Muir and Johnson, an act of Congress created Yosemite National Park. Muir was also personally involved in the creation of Sequoia , Mount Rainier , Petrified Forest and Grand Canyon national parks. Muir deservedly is often called the "Father of Our National Park System ". Johnson and others suggested to Muir that an association be formed to protect the newly created Yosemite National Park from the assaults of stockmen and others who would diminish its boundaries. In 1892, Muir and a number of his supporters founded the Sierra Club to, in Muir's words, "do something for wildness and make the mountains glad." Muir served as the Club's president until his death in 1914. In 1901, Muir published Our National Parks , the book that brought him to the attention of President Theodore Roosevelt. In 1903, Roosevelt visited Muir in Yosemite. There, together, beneath the trees, they laid the foundation of Roosevelt's innovative and notable conservation programs. Muir and the Sierra Club fought many battles to protect Yosemite and the Sierra Nevada, the most dramatic being the campaign to prevent the damming of the Hetch Hetchy Valley within Yosemite National Park. In 1913, after years of effort, the battle was lost and the valley that Muir likened to Yosemite itself was doomed to become a reservoir to supply the water needs of a growing San Francisco. The following year, after a short illness, Muir died in a Los Angeles hospital after visiting his daughter Wanda. John Muir was perhaps this country's most famous and influential naturalist and conservationist. He taught the people of his time and ours the importance of experiencing and protecting our natural heritage. His words have heightened our perception of nature. His personal and determined involvement in the great conservation questions of the day was and remains an inspiration for environmental activists everywhere.